The Department of Defense’s military health care management system, GENESIS, is an ambitious modernization project that aims to provide a single worldwide electronic health record (EHR) system for more than 9 million beneficiaries. Not only will the project will be a game-changer for EHR, but the lessons learned from its implementation will go a long way to help other large enterprises that seek to improve data-sharing with health care providers as well as patient care, according Commander Alexander M Holston, chief medical informatics officer at DOD. Holston discussed how GENESIS is progressing in a new podcast from FedScoop, describing it as a “system of systems.” He and Rob Sherry, senior director of federal health care for VMware, also discussed what lessons health system IT leaders can learn from the GENESIS project in order to make records more useful to patients and providers. An EHR is just one among many modules that connects to a database instance, Holston explains. Layered on top of that instance are other databases, for example, from the emergency room, operating rooms or repositories containing dental records. All these feed data into, and take data out of, the singular database with the eventual goal of creating one EHR for an individual. Sherry says the EHR challenges that large enterprises face essentially come around the data and the people. First, IT leaders need to resolve how to centralize and improve the data quality in-house. Additionally, for the system to be effective, organizations need to help users adapt to the new system and embrace the changes. People are fundamental to the success of EHR modernization, Sherry says. Holston advises that when organizations build a system, their strategy should honor the core mission of the enterprise. For the DOD, this meant prioritizing network security over things like agility. However, ensuring some flexibility within the system will ensure that it doesn’t become irrelevant, Sherry asserts. He advises organizations to plan for the arrival of new care models and technologies down the road. Outlining his vision for the future of electronic health records, Holston talked about how EHRs would operate as a platform that sits on top of a database. 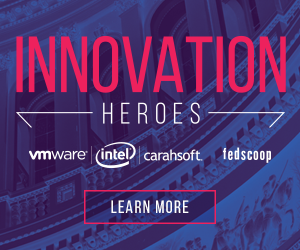 Learn more about other Innovation Heroes in government. This podcast was produced by FedScoop for, and sponsored by, VMware, Intel and Carahsoft.